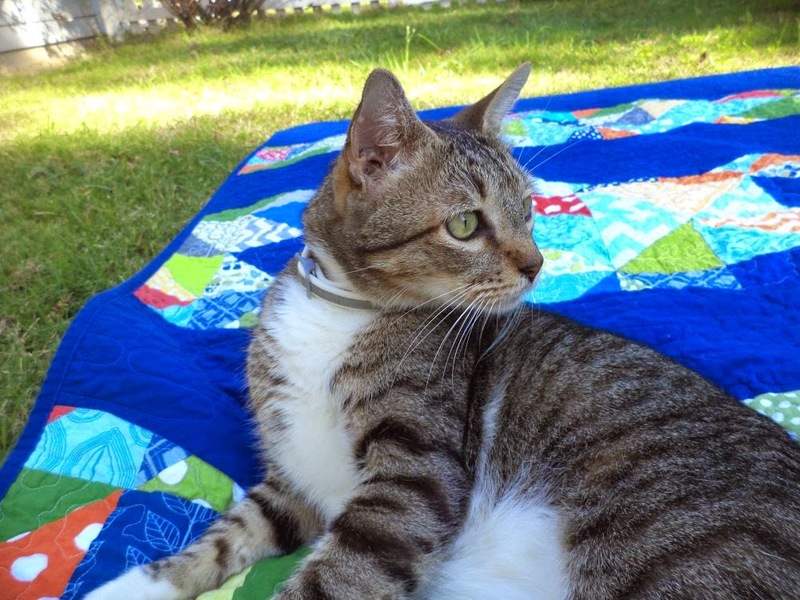 Kat & Cat Quilts: HST Waves, and There's a Cat on my Quilt! The HST waves quilt got done this morning. I'm so grateful for the Friday linkups that give me to push to get something done every week. This one will be a gift for a coworker having a baby soon. 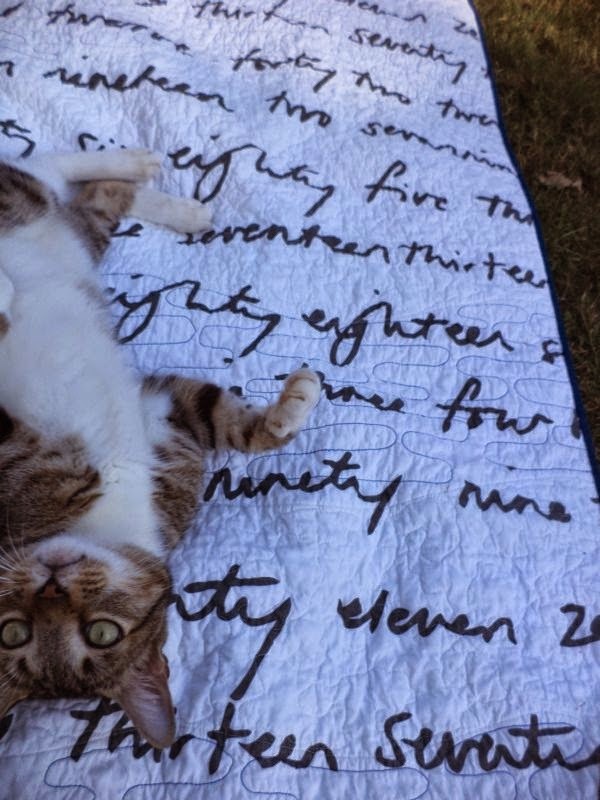 This quilt was meant to be similar to my Gatsby! quilt; I've been wanting to do something with pieced and solid waves blending together for a while now. The quilting was fun to do. First stitch in the ditch along the curved seam, then just a simple stipple over the pieced parts and this sort of elongated stipple that reminds me of ripples in a pond over the blue parts. I didn't find a tutorial for that one, but I've seen it several places including at Crazy Mom Quilts. I used the ever-popular IKEA numbers fabric for backing again. As you can see a bit above, and better in the pic below, I was switching my bobbin thread along with the top thread so the ripples show on the back in blue. The quilt finished about 42" x 60", a generous size for a baby/toddler quilt. Here's hoping it will be enjoyed by these 2 little boys for years to come! And now that we have all paid homage to the king perhaps he will get off my WIP stack so I can get back to work! Such a fun quilt! It is modern and bright and perfect for baby. I'm really diggin' the wave action too. Very cool! Lucky little one! That's gorgeous, a really striking design and the colours are lovely.I do really like the pictures of Wilson enjoying the quilt and giving it his seal of approval. He looks even more adorable in the picture of him washing himself on the back, beautiful boy! 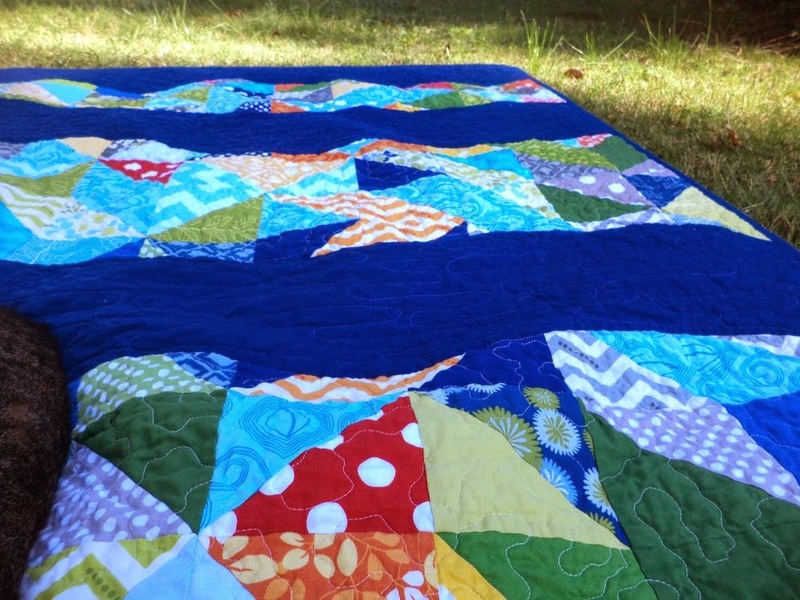 This quilt is super adorable and fun! I'm sure the new baby will love it. I love your cat. Tabbies are the best, aren't they? 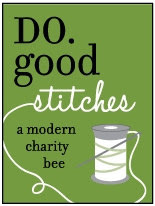 That's a fun idea, waves of solid and piecing, softer than a zig zag. I like it. Love that royal blue color! 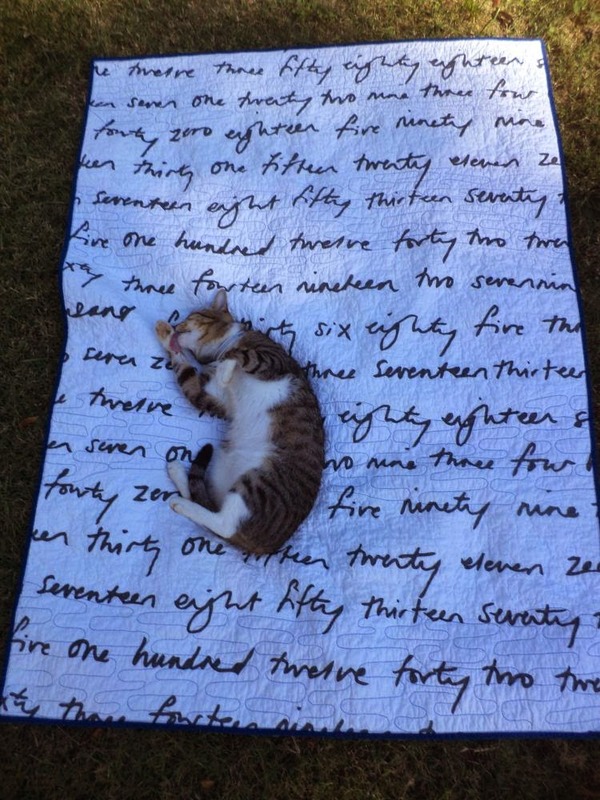 The quilt is adorable and sure to be enjoyed. Nice job! 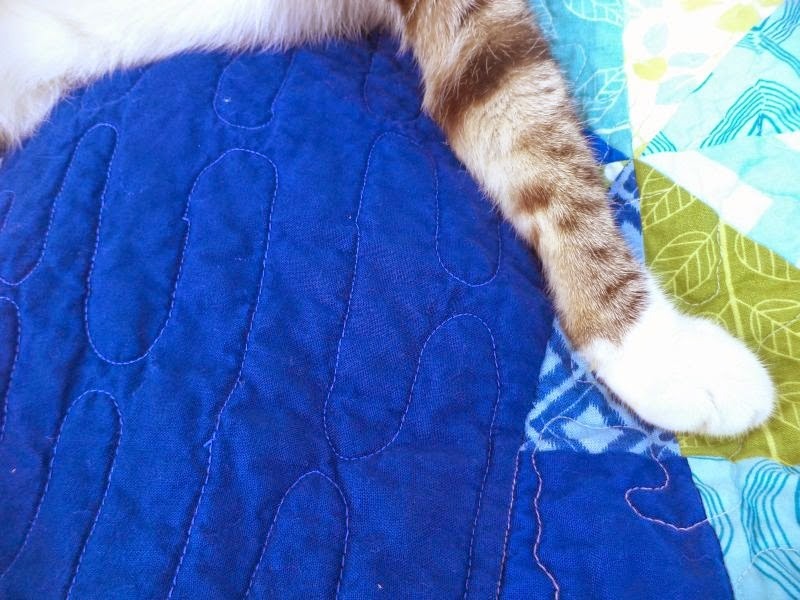 Gorgeous quilt....I have 2 cats that love a just fluffed quilt too. 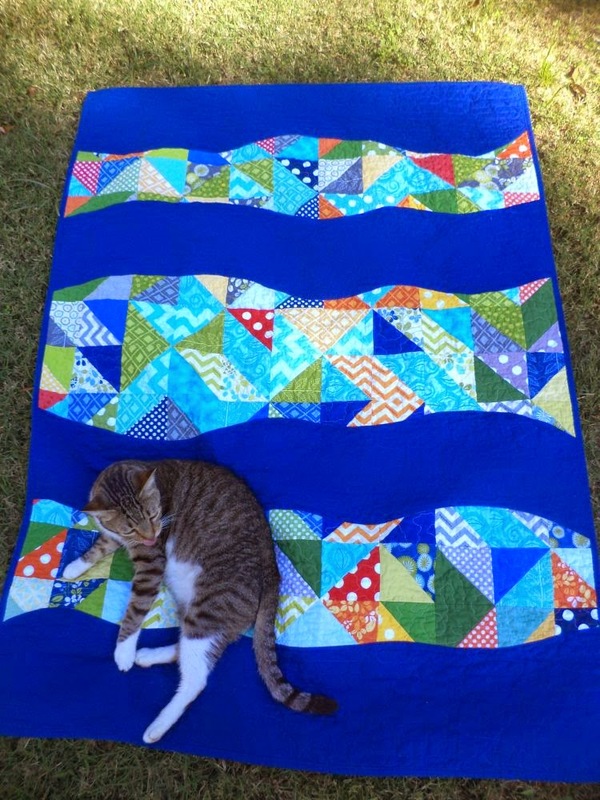 I love the quilt design and the kitty! Oh my gosh! Wilson!!! What great photos! 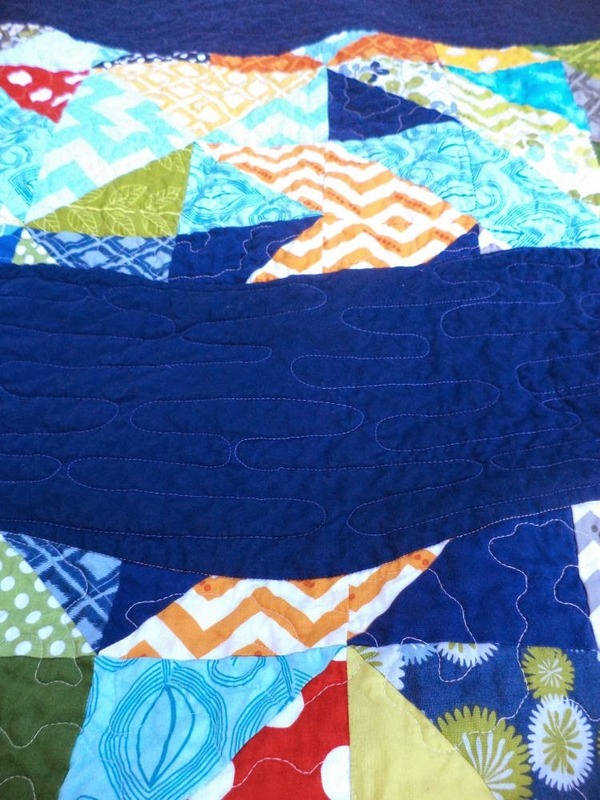 And such a bright and playful quilt! Love the wave effect and the colours. It looks great.